Consideration is given to the effects of inhomogeneous shear flow (both regular and chaotic) on nematic liquid crystals in a planar geometry. The Landau—de Gennes equation coupled to an externally-prescribed flow field is the basis for the study : this is solved numerically in a periodic spatial domain. The focus is on a limiting case where the advection is passive, such that variations in the liquid-crystal properties do not feed back into the equation for the fluid velocity. The main tool for analyzing the results (both with and without flow) is the identification of the fixed points of the dynamical equations without flow, which are relevant (to varying degrees) when flow is introduced. The fixed points are classified as stable/unstable and further as either uniaxial or biaxial. Accordingly, various models of passive shear flow are investigated, with the main focus being on the case where tumbling is absent from the model. In this scenario, not only must advection of the Q-tensor be considered, but also its co-rotation relative to the local vorticity field. Thus, only the biaxial fixed point survives as a solution of the Q-tensor dynamics under the imposition of a general flow field. For certain flows for which co-rotation effects can effectively be ignored along trajectories, both families of fixed points survive. 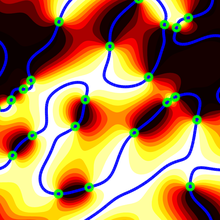 In this scenario, the system exhibits coarsening arrest, whereby the liquid-crystal domains are `frozen in’ to the flow structures and the growth in their size is thus limited. The outcome (biaxial final state or a mixture of both families of fixed points) can be understood in terms of the flow time- and length-scales that manifest themselves through the co-rotational derivative. Some consideration is also given to the specific case where tumbling is present ; here, the flow has a strong effect on the liquid-crystal morphology. Lennon is collaborating with P. Spelt and A. Naso.